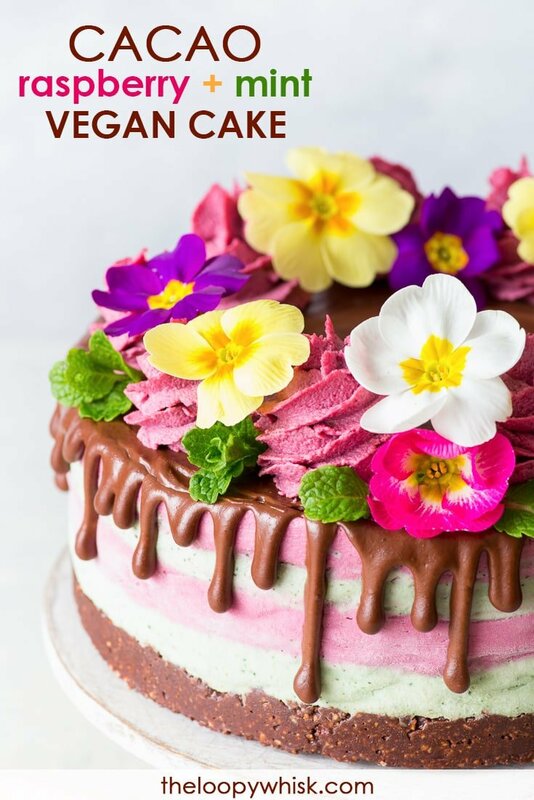 It’s impossible not to love this beautiful vegan cake, with its delicious play of flavours and textures. 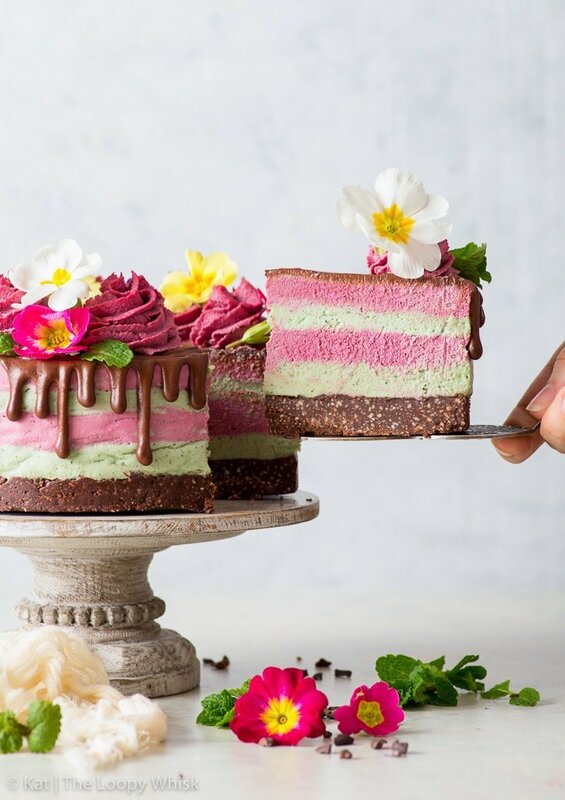 From the creaminess of the mint and raspberry layers, to the crunchiness of the cacao + almond crust, this vegan dessert tastes just as good as it looks. And that’s saying something – because this one is absolutely jaw-droppingly beautiful! We’re nearing the end of March and it feels like spring’s finally here to stay. 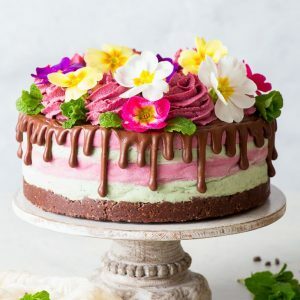 I’m celebrating the sunshine and the explosion of colour everywhere with this gorgeous cacao, raspberry & mint vegan cake. And what a jaw-dropping, eye-catching beauty of a cake it is. 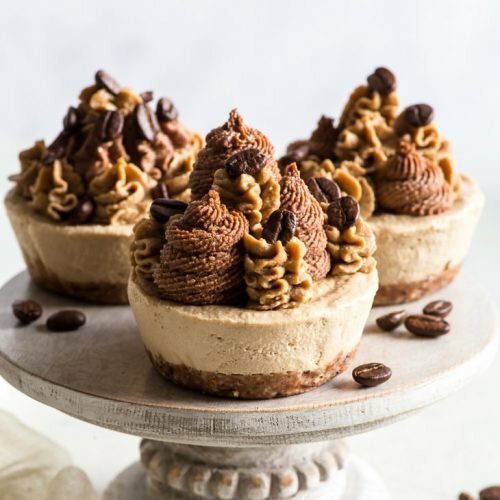 It’s the healthy no-bake, raw vegan kind of cake as well, the kind that makes you feel all energetic and gives you that wonderful I’ve-totally-got-this feeling. You know, the feeling you get when you wake up early on a bright spring morning filled with cheerfully chirping birds, and you feel pleasantly rested – ready to take on the world and emerge as the winner. 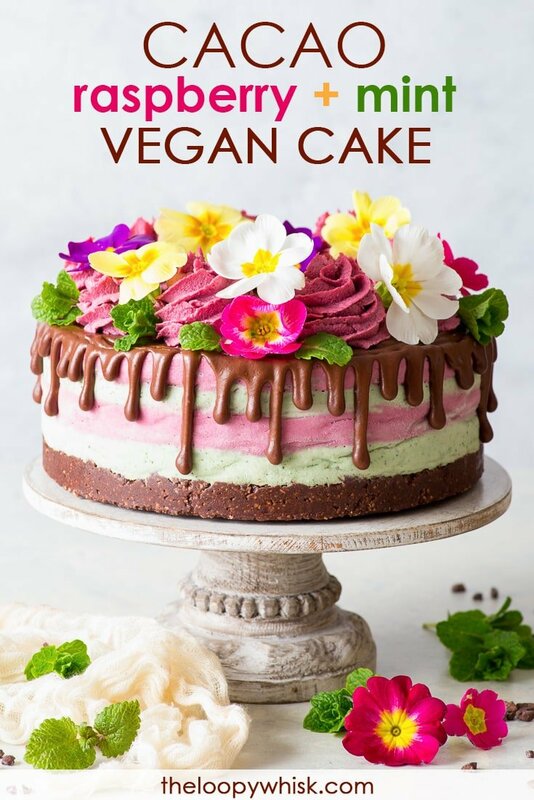 There are numerous things to love about this vegan cake – but let’s start with the obvious: how DROP DREAD GORGEOUS it looks. Then, there are the flavours: the freshness of the mint combined with the tart sweetness of the raspberries, brought together by the earthy deliciousness of chocolate. Each of these flavours on its own is, of course, wonderful – but combined, they set off fireworks on your tastebuds. While we’re on the topic of chocolate: I’ve used THREE different forms of chocolate (or, strictly speaking, cacao) in this raw vegan cake – Food Thoughts® 100% Cacao Melts®, Cacao Powder and Cacao Nibs. Because, as we all know, with chocolate: more is more. All three products come from the wonderful chocolate brand Food Thoughts®; I’m officially obsessed with their products! The 100% Cacao Melts® especially are a complete revelation – pleasantly bitter and flavourful, they capture the very best of chocolate. 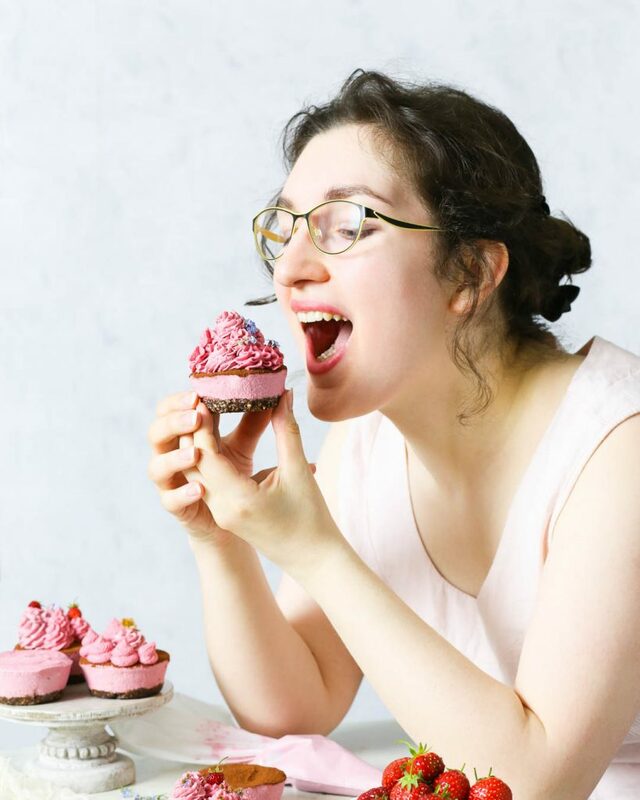 Plus, being sugar free, they allow you to tweak the sweetness of your chocolate creations yourself, which I absolutely love! 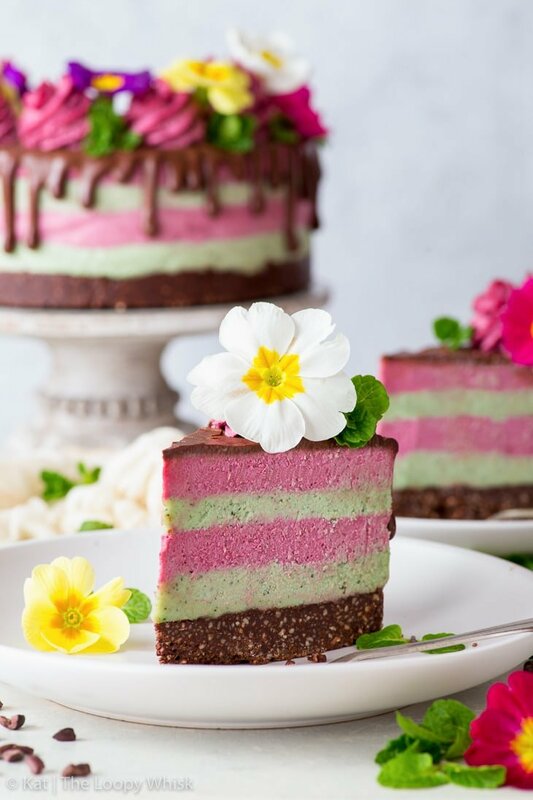 Of course, we can’t forget the textures: the creaminess of the alternate mint and raspberry cashew cream layers, the crunchiness of the almond + cacao crust (thank you, cacao nibs!) and the lusciousness of the cacao drizzle made with the Food Thoughts® 100% Cacao Melts®. 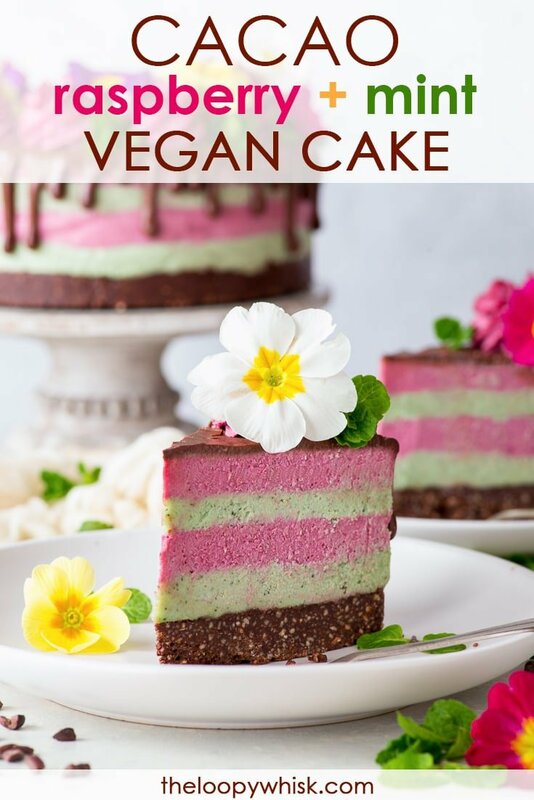 I’ve always found the texture of any dessert to be just as important as its flavour – and this vegan cake definitely delivers on both fronts. When it comes to decoration… really, the only rule is to go as vibrant, cheerful and colourful as possible. 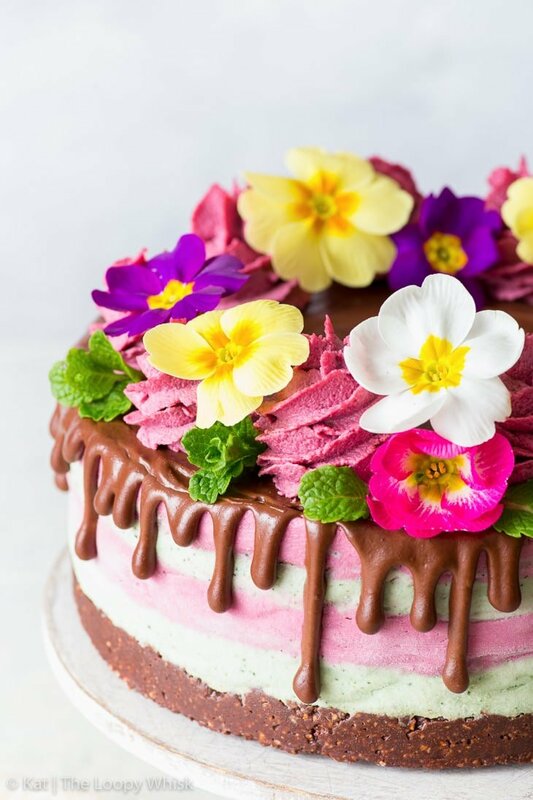 This is a let’s-celebrate-spring cake, so edible flowers are an obvious choice – and don’t they just put a smile on your face? There you have it, friends. 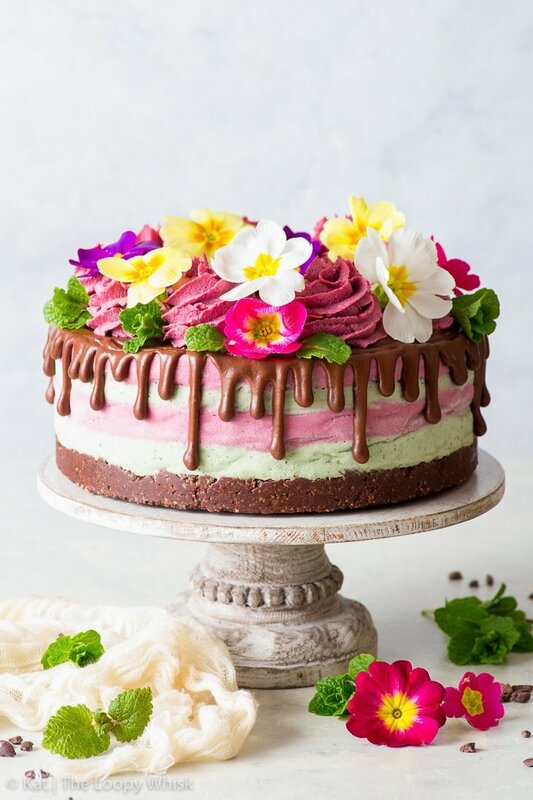 A celebration of spring, in cake form. 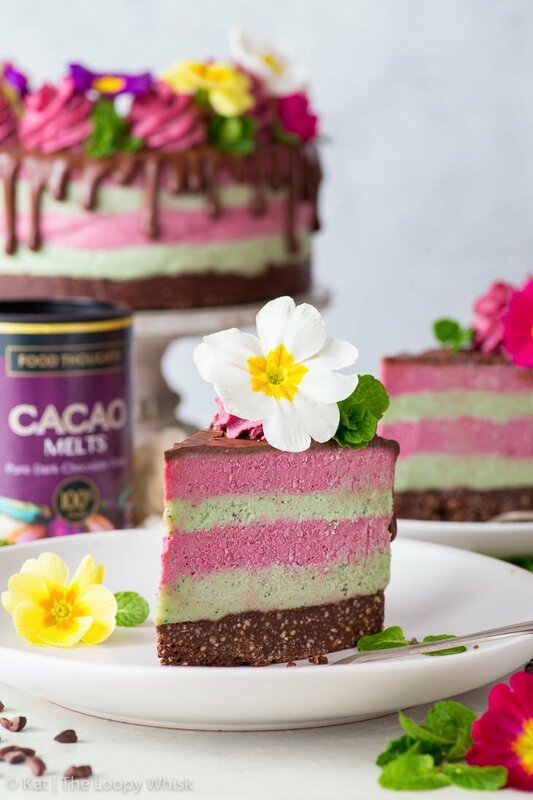 A meeting of raspberry, mint and cacao that results in something beautiful and delicious, and brings a smile to your face. As always, enjoy. Savour. And have fun. 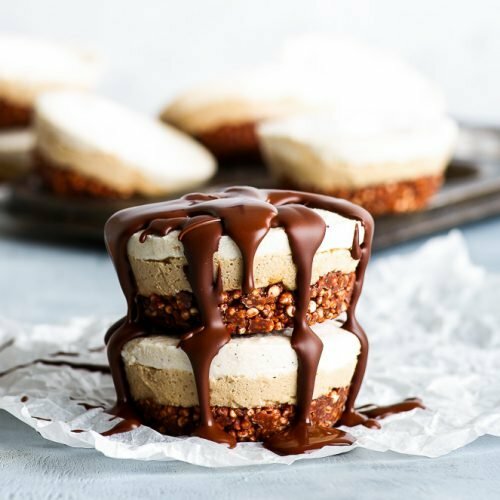 NOTE: This recipe requires soaked cashew nuts, which need to be soaked OVERNIGHT to get the creamiest texture possible. In a large bowl, soak the cashew nuts in water overnight. The next day, drain the cashews and set them aside until needed. Get a 8 inch (21 cm) springform cake pan ready to have on hand. Ideally, the springform pan should be at least 3 1/2 inches (9 cm) deep, allowing you to create fairly thick layers of different coloured cashew cream. To make removing the cake from the springform pan easier, I recommend lining it with either baking/greaseproof paper or acetate paper (commonly used for making chocolate decoration or patisserie). In a large bowl, mix together all the crust ingredients until you get a homogeneous mixture that holds together well when you press it together. It shouldn't be too sticky. If the crust mixture feels too sticky/wet, add more ground almonds. If it's too crumbly, add more coconut oil or maple syrup. Press the crust into the springform pan, forming an even layer at the bottom. Freeze for at least 15 minutes or until firm. In a saucepan, cook the raspberries on medium-high heat until they have released their juice and part of the liquid has evaporated. Pass the raspberry mixture through a sieve to remove the seeds and skin. Return the raspberry juice to the saucepan and cook further until it has decreased in volume to about 1/3 cup. In a high speed blender or food processor, blend the soaked cashews until smooth. Add the rest of the raspberry cashew cream ingredients (including the raspberry reduction), and blend until combined and smooth. At this point, you can adjust the sweetness and tartness by adding more maple syrup and/or lemon juice. 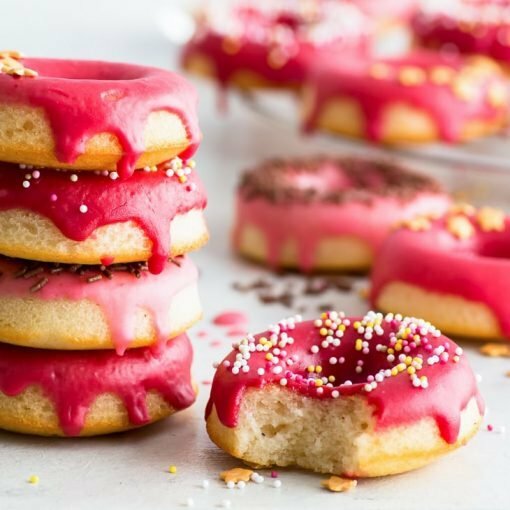 You can make the pink colour more intense by adding some beetroot powder or ground freeze-dried raspberries. Transfer to a bowl and cover with a lid or cling film until needed. In a high speed blender or food processor, blend the soaked cashews and mint leaves until smooth. Add the rest of the mint cashew cream ingredients, and blend until combined and smooth. At this point, you can adjust the sweetness and tartness by adding more maple syrup and/or lemon juice. 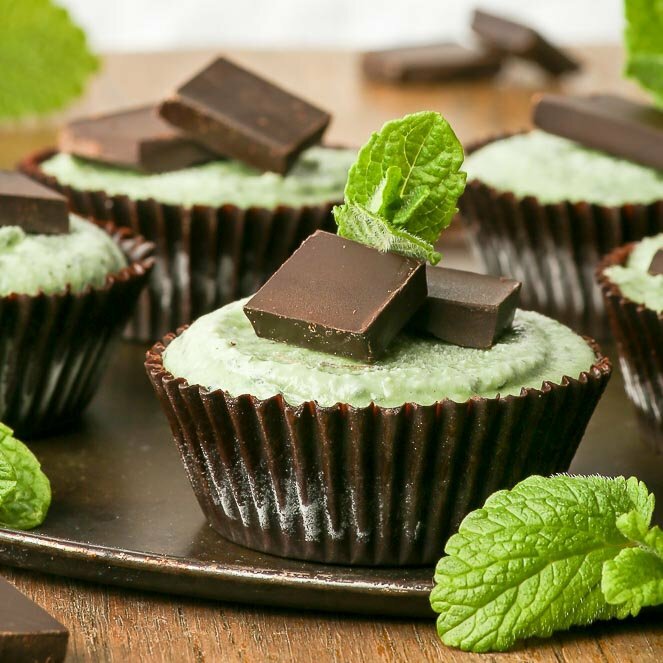 You can make the mint flavour more intense by adding a few drops of peppermint oil/extract. Similarly, you can make the green colour more vibrant by adding some spirulina powder. 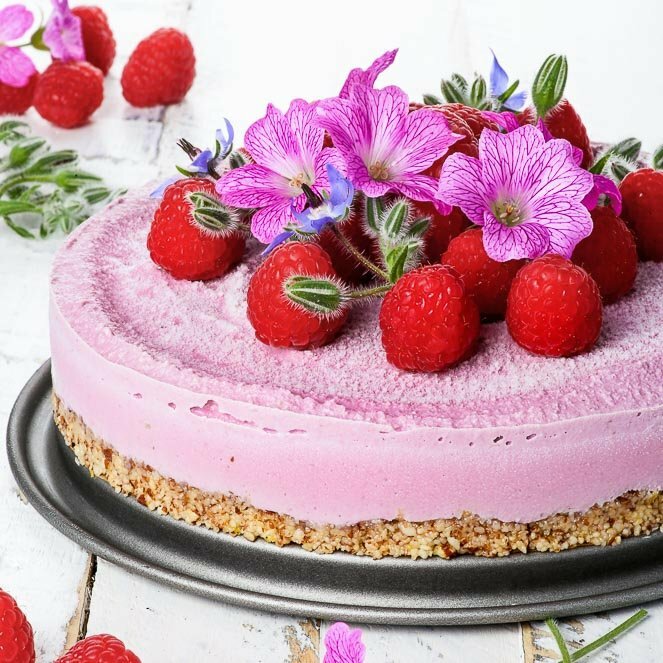 Transfer the raspberry and cashew creams in alternating layers into the springform pan, smoothing out the top to form an even layer each time. For extra well-defined layers, freeze the cake after each cashew cream addition. 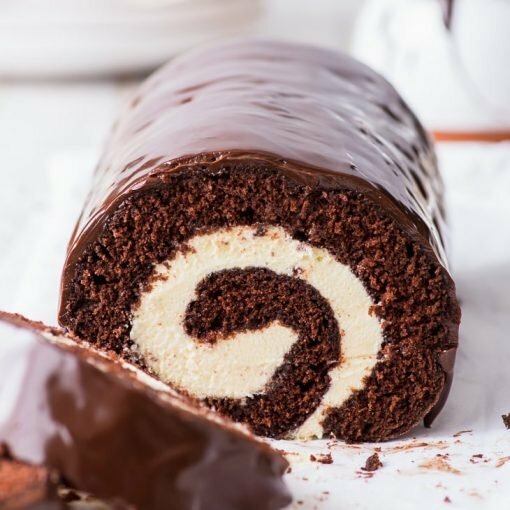 NOTE: If you want to decorate the top of the cake with piped swirls of cashew cream, make sure to set some aside for this purpose. Just place it in an air tight container into the fridge until needed. Freeze the cake for at least 8 hours or preferably overnight, giving it time to firm up. 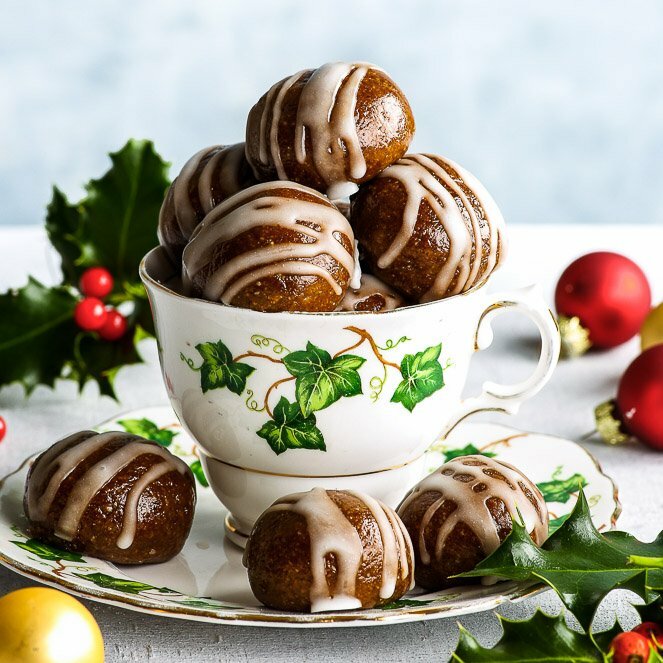 Combine all cacao drizzle ingredients in a saucepan, and heat them on medium-low heat until the 100% Cacao Melts® have melted and you get a smooth, glossy mixture. Allow to cool slightly (until warm). Drizzle the cake with the cacao drizzle, allowing it to drip down the sides. It will firm up on contact with the cold cake, but retain most of its shine. 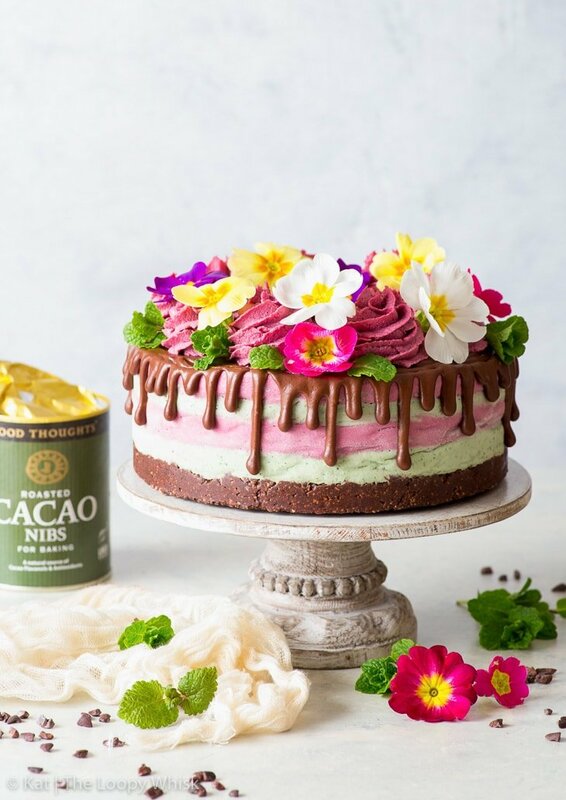 Pipe swirls of cashew cream on top of the cake, and decorate with sprigs of mint and edible flowers of choice. 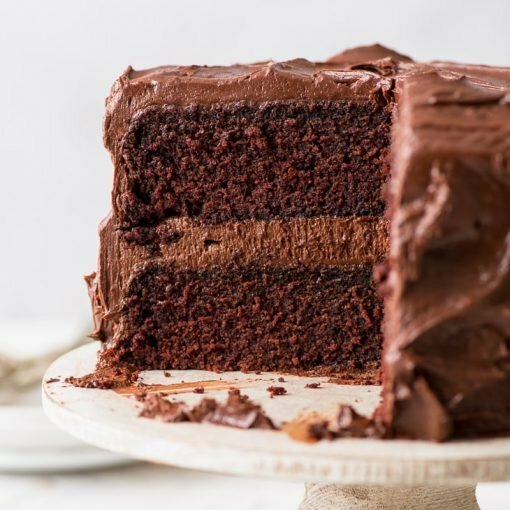 Allow the cake to thaw for at least 15 minutes at room temperature (after you;ve taken it out of the freezer) before cutting it with a hot knife (that is, a knife you've dipped into hot water beforehand). Cutting it sooner or with a cold knife makes it much more difficult. 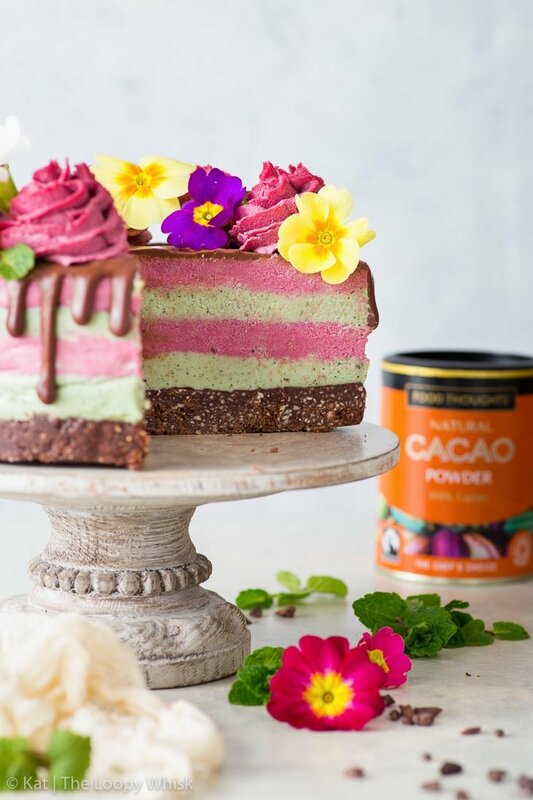 The cacao, raspberry & mint vegan cake keeps well in a closed container or wrapped in cling film in the freezer for 2 - 3 weeks. I recommend you pre-cut the cake before freezing it for storage – that way, you won't have to thaw the whole cake to cut a slice. 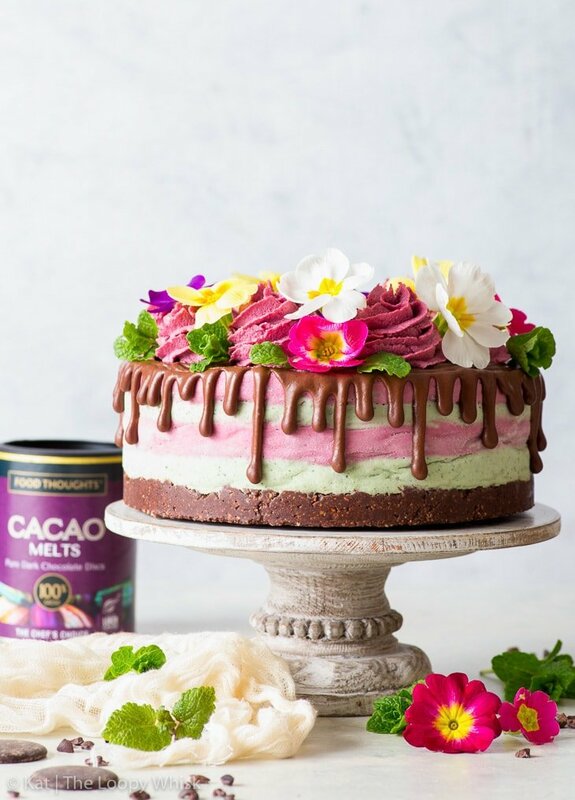 Note 1: The 100% Cacao Melts®, cacao powder and cacao nibs are all from the wonderful chocolate brand Food Thoughts® – couldn't recommend them enough! Note 2: You can get coconut cream by putting coconut milk (the type from a can, with a high coconut content and without too many stabilisers/preservatives) into the fridge for a few hours – without shaking! The coconut milk will separate into coconut cream (that you'll need in this recipe) and coconut water (which is great in smoothies). Looking for more delicious raw vegan recipes?